I was struck by a couple of things. First, I only had three baby dolls, all Tiny Tears, one of whom was stolen from the pram, the other two given away so there are none of those. 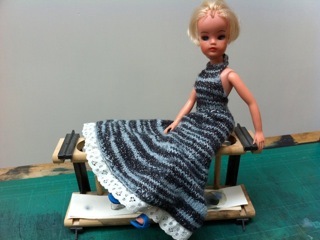 Second, all my dollies have shoes and pants. It's a long time since I put that many tiny pairs of knickers out to dry. And third, how many of the clothes me and my Mum made ourselves. We were very short of resources, but Mum could sew anything, and in fact made all of our clothes herself. This was not out of choice, but it did mean that anything she made, she could make at one-eighth of the size, and that meant that by the age of 11, I could too. 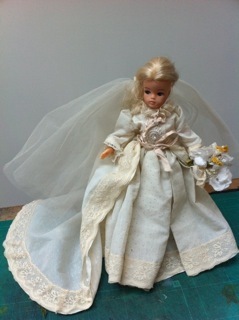 This is a version of Lady Diana's wedding dress which we made for the Royal Wedding. Her train was measured to be the same proportional length as Diana's, and her flowers were correct. I thought about cutting her hair...but thankfully resisted. She also has a crystal head-dress. 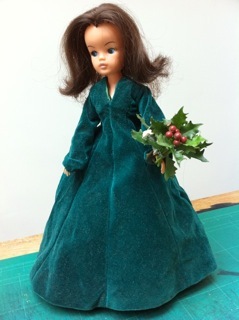 Fifteen years later, Mum made this version of my emerald velvet bridesmaid's dress worn at my best friend's wedding. We wore boots and thick tights for the December 27th wedding, and had an identical bouquet. She also made an exact copy of Jules' wedding dress, which she still has. 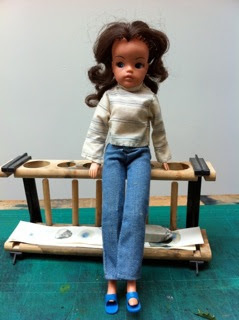 Check Sindy's flares. The jeans were bought, but the blouse was made. Those shoes were the easiest to fall off and I'm astounded I still have them both. 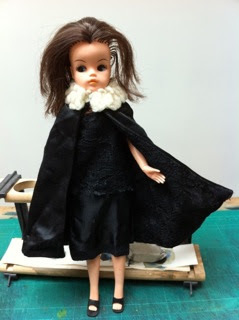 Glamourous brunette Sindy, a ballerina by trade, wears a hand-made fur-collared cape lined with the same black lace as the halter neck dress beneath. And of course, black strappy shoes. 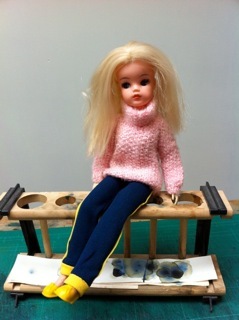 For a more relaxed occasion, Sindy wears a crocheted pink mohair polo neck with shop-bought jogging bottoms. This Sindy wears the yellow moccasins, because she is an adopted one, and as such bears the scars of a pet dog who likes doll feet. Purrrrrr! Glamour. Knitted sparkly halter-neck with lace trim and blue slip-ons. And...a haircut NOT by me. Another adopted Sindy. 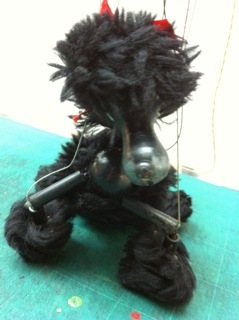 As well as the dolly clothes I made toys. 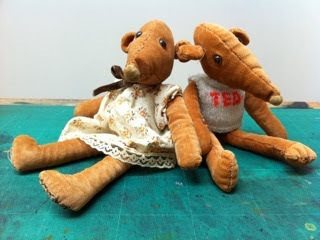 This is Shrew and Shrew, one made about a month after the other. They've never been apart and came to France with me aged 11, when David Rinaldi dangled one aloft over the side of the ferry and threatened to drop. He didn't, but he's still quite the b*stard for showing such cruelty. 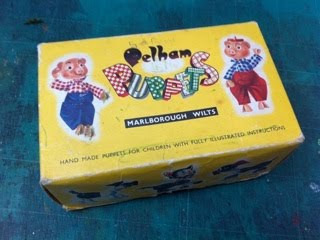 And finally, these bonkers creations were found in Grandma's house after she died. We don't think she made these clothes - she was NOT the crocheting type - but there's such attention to detail I had to keep them. 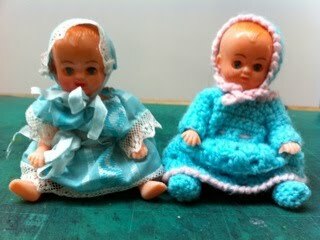 They have matching turquoise knickers and check the little tiny slippers. Pair of hard gits, these boys. Finally, I didn't make this - this was a compensation gift from Grandma when my sister was born, so I didn't feel she was getting all the attention. Or at least that's how I remember it. I love the box. And it's mine, look - it says so! Genial post and this post helped me alot in my college assignement. Say thank you you on your information.